With the General Elections over, you would think that we would have our letter boxes back. What do I mean? Well, during the run-up, we would come home and find our letter boxes stuffed with literature. This campaign period was two weeks of busy-busy-busy sifting through our regular mail from the publicity papers. One would have thought that since so many things are digital, from advertising contents, magazines and books to the social media on the internet, people would not refer to the printing press anymore. But not so fast. Prints is very much alive as most people still like the feel of a hard copy, be it a book or magazine. And obviously brochures never went out of fashion. Why? Because it is more convenient to give out brochures than to email contents to someone we do not have contact with on the street. Or as in this case, whom we hope will vote for us even though we have no personal contact! So don’t write off the brochure printing companies yet, breathe a sigh of relief that the GE is over, and yes, look out for some other regular mail…. ! Now I MUST tell you about the lamb we had the other night. I kid you not. 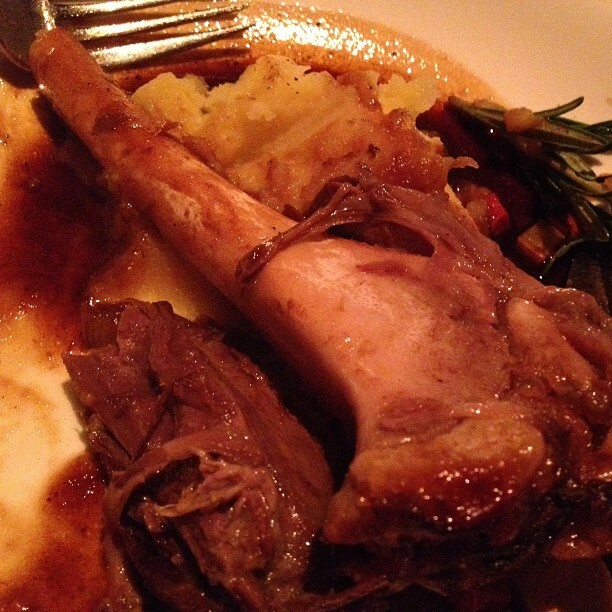 It was so tender that the meat slid off the bone super smooth and easy. Just look at it! The sauce was a perfect complement. And there was just enough of it – the way food served at fine dining should be. The vegetables? Diced carrots and celery were surprisingly a good combination to go with the entire dish – both the taste and texture were yum!!! As a vegetable lover, I found myself looking for more. Haha! So yes, nice food… stay tuned for more coming up later…. Hmmmm best to leave it for now. It was a review we did. So we can’t reveal it yet HeeHee!